For the inaugural issue of Demeter’s Spicebox, we wanted to revisit a tale that stands poised in between the active or passive heroine. Tatterhood, or the Aarne-Thompson folktale type 711, is a tale about both motherhood and what it means to be either the beautiful or ugly twin. The original folktale, as collected by Peter Christen Asbjørnsen and Jørgen Moe, was a favourite of mine as a teenager. How could it not be? It was a tale that was refreshing in that the active and not attractive heroine prevails, but it also captures that insecurity that lies at the heart of every person who has felt marginalised, Othered or has been considered unattractive. While Hans Christian Anderson’s Ugly Duckling and some other stories which speak of that transformation between ugliness and beauty espouse waiting, self-discovery, and to a certain extent, passivity, the heroine of Tatterhood seems to know a secret, and is active in furthering not just her destiny, but that of her loved ones. This is not just an empowering message in a folktale; it is a delectably subversive one, as well. So, would writers be able to subvert this even further? It appears as if they could, and would. Both Shveta Thakrar and Mari Ness have given us beautiful versions of Aarne-Thompson type 711, presented with a twist. These are tales that will stir your imagination and evoke emotional reactions. Mari Ness’s lyrical and moving Sister and Bones takes us to the Far East in a story of sisterhood, loss and triumph. Shveta Thakrar’s Lavanya and Deepika brings us back in time to Ancient India, in a story which is lush and lyrical, with imagery that transports. Both tales share a harmony in thematic concerns, and both writers have woven in different fairytales within the Aarne-Thompson type 711 tale they reworked. They have defied our expectations of both activity and passivity by writing stories which are a powerful testimony not just to wonder and magic, but to the strength of human relationships and filial ties. 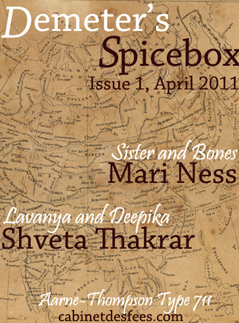 Both writers are therefore exactly what the inaugural issue of Demeter’s Spicebox needed and we are delighted to feature them. A map was chosen for the cover of Demeter’s Spicebox because it is an old map, one which shows the world in the nineteenth century. It was drawn up, created and carved out by colonial forces. In postcolonial studies, there are debates about whether embracing hybridity is equivalent to accepting the power dialectic imposed upon us by the forces of colonisation. It is not the aim of Demeter’s Spicebox to academically address these questions, but to instead show you the power of the story to both transgress and transcend borders – for stories are hybrid beings too, and may end up far-flung from their point of origin. The act of placing each story, and author’s name on the map, is therefore an act of defying those hegemonic structures with the power of each fairytale. For each issue, we will consider not just the map, but the power of stories to reshape and refashion what we know of the world. While it may seem audacious and a bit dangerous to encourage retelling a tale-type that comes from one part of the world in a different culture or climate, we feel this is the best way to express that sense of exploration, the transgression of state-lines and borders created to keep the outside where it “belongs”. In a world that is today more and more self-conscious of difference, where checkpoints have become points of contention, the issue of borders and the sense of belonging becomes even more fraught, especially for those of us who are the hybrid children of multiple diasporas and cultures. Growing up, not knowing which state or culture I could consider myself belonging to was an incredibly alienating feeling. An only child and an introvert who spent most of her life in South East Asia reading, I realised one singular truth. I belonged to the stories. The fairytales and folktales I gorged myself on came from more than one culture, more than one destination on the map, but each revealed to me a hidden truth, a lesson or some strange, undefineable magic that brought me further down the road. The stories charted for me a different kind of terrain, one that was wholly internal, and hybrid to a chaotic degree. The things I love best come from that strange world between traditional conceptions of boundaries, where an act of love might be an act of transgression, and vice versa. While this may seem a wholly personal way of approaching an inaugural editorial, I also know I am not the only one with these personal stories. We all have them: readers, writers, lovers of the fairytale and folktale. It cannot be anything but personal, because fairytales are personal. They speak to us with the resonance of life-journeys. 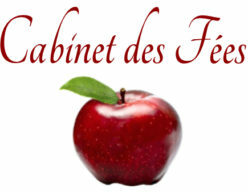 My co-editor, the wonderfully talented wordsmith and magician of books, Erzebet YellowBoy reminds us again, and again, “Fairy tales, must be told.” It is a truth that has guided every edition of a Cabinet des Fées publication. As the second Cabinet des Fées online publication, Demeter’s Spicebox also seeks to embody this fundamental ethos behind the impulse to make stories. Demeter’s Spicebox, as noted in our introduction, is not merely about revising lesser-known folktale types. We encourage interconnectivity and hypertextuality; our challenge to each writer was to create either footwear or an old teapot that would have to be included in the next issue. Both Mari Ness and Shveta Thakrar have created objects which excite the imagination and which are ripe for inclusion in future stories. Watching these objects appear in future tales will be thrilling and an adventure. We hope you have your compasses and flashlights ready, and have packed enough victuals in your knapsacks for this journey!